How to solve "System.MethodMissingException" in Xamarin.Forms.iOS when using SfListView? When creating Xamarin.Forms samples that uses SfListView with Linker Behavior in iOS renderer project as “Link Framework SDK’s only”, System.MethodMissingException will be thrown. This error occurs based on the iOS version of the Xcode. It works fine in iOS 9.1 whereas will crash in 9.2 and versions earlier than 9.1. This is reproducible even in a simple scenario and has been reported as a bug in Bugzilla as well. You can see the details of it from the below thread. However, you can able to skip this error in two ways either by changing the “Linker Behavior” or by “Setting custom linker argument” which are explained below. To avoid this issue, please choose the Linker behavior as ”Don’t Link” in the iOS renderer project. You can also bypass this error by setting a custom linker argument. Check the documentation here. You can set an “mtouch” argument to skip the assembly which needs to be preserved. 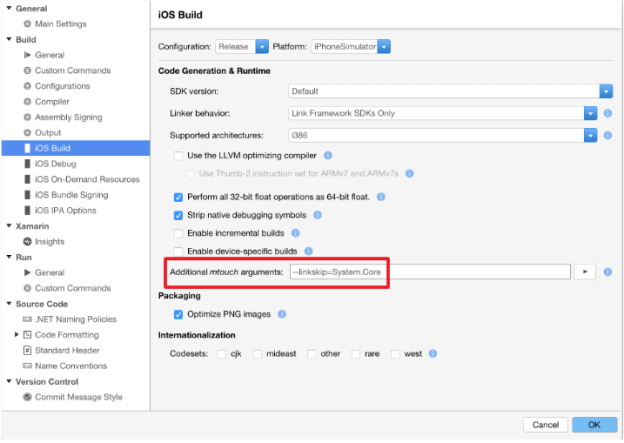 For this error, you will be able to run your app by skipping the System.Core assembly. Refer the screenshot for more details.